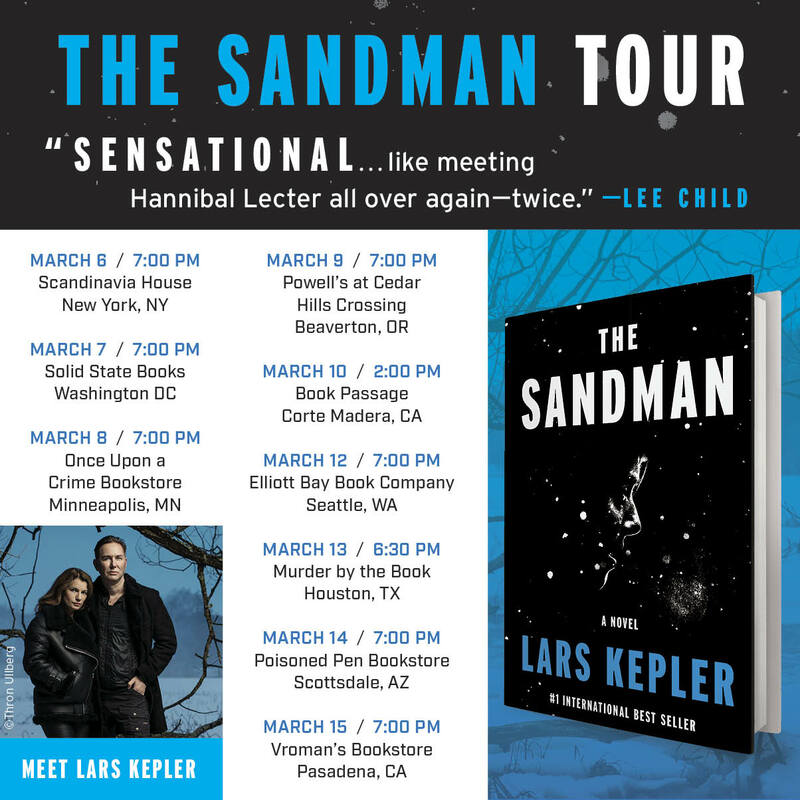 Next week, Lars Kepler's latest book in their Joona Linna series, THE SANDMAN, will be released in the US. 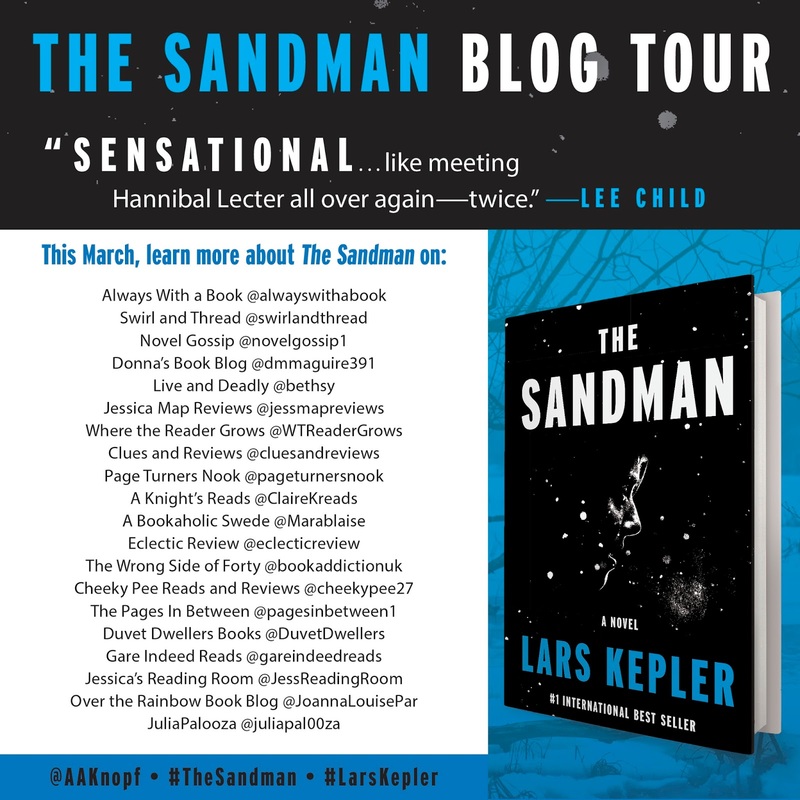 This Scandinavian thriller is perfect for those readers who like gritty, chilling, fast-paced crime-fiction. Now, not to worry if you haven't read the prior books - this book works great as a stand-alone (and where I am starting!). 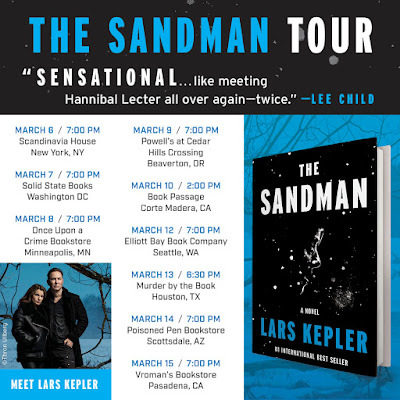 If you like Stieg Larsson or Jo Nesbo...this book, and series, is for you! And, last but not least...I have one hardcover copy of the book to giveaway - to help entice more interest in the book and these authors! I'm telling you...this book is good. I'm about halfway through right now and I can't read it fast enough - between the short chapters and the suspense on both the psychological and physical level - I'm having a hard time putting it down to get anything else done. I know for sure that I will definitely be picking up the prior books in this series after I finish this one! 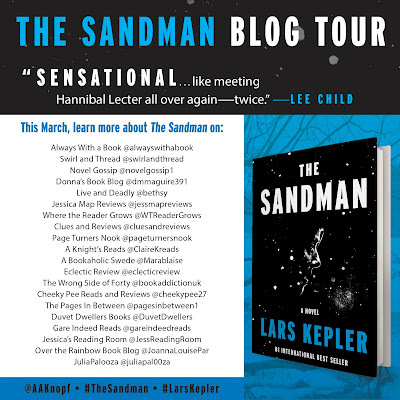 Thanks to the publisher, one reader will win a copy of The Sandman by Lars Kepler. To enter the giveaway, please fill out the rafflecopter by March 7th. This giveaway is open to US residents only and ends March 7th. 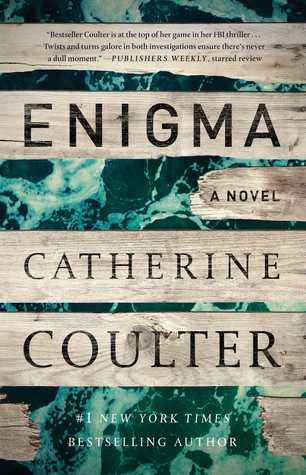 Today, Catherine Coulter's latest FBI Thriller, Enigma, is being released in Trade Paperback and to help get the word out, I'm pleased to offer you, my readers, a chance to win a copy...and there are 2 copies up for grabs!!! I am desperately behind in this series and have so serious catching up to do, but I can assure you, it's on my list...but in the meantime, read the spotlight, see what other's have to say, and be sure to enter the giveaway below!!! The highly anticipated twenty-first FBI thriller by #1 New York Times bestselling author Catherine Coulter presents Agents Savich and Sherlock with two baffling mysteries. Working with Agent Cam Wittier (Insidious) and New York-based former Special Forces agent Jack Cabot, they must race against the clock to catch an international criminal and solve the enigma of the man called John Doe. Thanks to the publisher, two readers will win a copy of Enigma by Catherine Coulter. To enter the giveaway, please fill out the rafflecopter by March 6th. This giveaway is open to US residents only and ends March 6th. Dreaming in Chocolate by Susan Bishop Crispell is one of BookSparks "Winter Reads" reading selection picks. "I never envied a wife or a husband, until I met Eleanor. Then, I would have traded everything I ever had, every limo ride, every skinny dip, every byline and carefree stroll, for what Franklin had, polio and all." 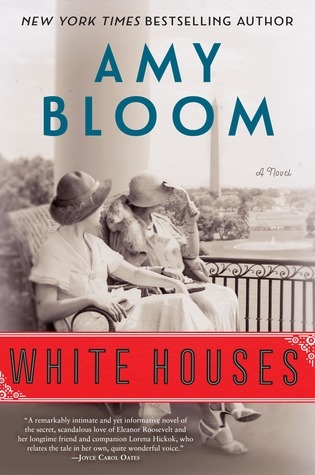 "Amy Bloom knows the urgency of love," wrote The Washington Post about Bloom's acclaimed bestseller Away. The same could be said of White Houses, an unforgettable novel about the power of passion and the endurance of love. My thoughts: Ever since visiting Hyde Park and Val-Kill a while back, I've become slightly obsessed with all things Eleanor Roosevelt and have slowly started collecting books about anything related to her. Of course, when I saw that Amy Bloom - an author I am ashamed to admit I have yet to read - had written a book about Eleanor's secret affair with Lorena Hickok, I just knew I had to read it! I remember when I was taking the tour of Val-Kill, the tour guide made one statement that stuck with me and as I was reading this book, that statement kept coming back to me. The statement went something like this, "The grandkids of Eleanor and Franklin were not bothered by their many dalliances of either sexes...they loved them for who they were." So, they were aware that both had many affairs, some of opposite sexes, and some of the same sexes, but it didn't seem to bother them. I wonder if it's everyone else that seems bothered by it. This is a fictional account of the love affair that happened between Lorena "Hicks" Hickok and Eleanor Roosevelt. It's told from Hicks' point of view and while centered around the few days right after FDR's death, it does move back and forth in time as Hicks reminisces about not only her childhood but about the early days of her affair with Eleanor. It truly is a remarkable character study of all involved. It's hard to imagine that this secret (or maybe not so secret after all) affair started when Hicks was still a journalist and came to the White House to interview First Lady Eleanor Roosevelt. The two hit it off and so their friendship was started. It just so happened that at this time, there was no longer any spark between FDR and Eleanor, so I guess you can say timing is everything. But, here's where things get interesting. Eleanor moves Hicks into the White House and is able to keep her "relationship" with Hicks quiet, yet FDR was not as secretive with his affairs. It definitely wasn't the case of what's good for the goose is good for the gander. This was a beautifully written, tragic love story. And it's one of the stories that makes you want to read more about the topic because while this is a fictionalized account, it is based in reality. Apparently there were an enormous troupe of letters written between these two women that have provided fodder for numerous books to be written on this relationship - and I have to admit I am slightly curious to see just how each other has put their own spin on it. So dear readers, don't be alarmed if you see other reviews of books about this same topic. My curiosity is piqued and I am ready to devour these books! Have you read a book about this relationship? Please share! The suitcase was badly rusted, and took Erika several attempts, but it yielded and sagged open as she unzipped it. Nothing could prepare her for what she would find inside…When a battered suitcase containing the dismembered body of a young man washes up on the shore of the river Thames, Detective Erika Foster is shocked. She’s worked on some terrifying cases but never seen anything like this before. My thoughts: This is another series that I just love and find that gets stronger and better with each new installment. 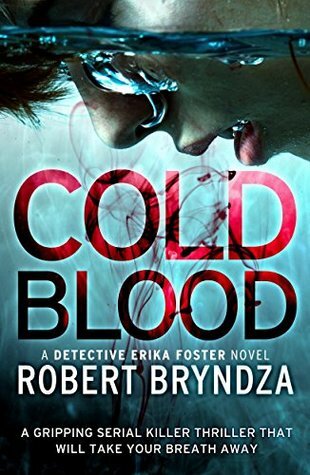 This is the 5th book in Robert Bryndza's Detective Erika Foster crime thriller series. These books are dark and twisted and oh so good!!! Once again we have an action-packed tale that takes off right from the start and never really lets go until the very end. Unfortunately, things get a little personal this time around as Erika is brutally attacked during the investigation and sidelined for a bit...though, in true Erika fashion, not for long! This is why I love her so much - nothing really keeps her down for long! She is tough and persistent and despite all that happens to her in this book, she still makes this case her number one priority. I do wish, though, that at some point in this series, she gets a little bit of happiness thrown her way - just a little! I also love that the characters that we meet in these books, the ones that are not necessarily part of the series from book to book, are so well-developed. And they are also not always so likeable. These characters have dimension and complexities to them, and make them more relatable, and you can get a feel for why they may or may not be in the predicament that they find themselves in. This book is equal parts creepy and disturbing and I loved every bit of it. It's so easy to get completely caught up in these stories - both for the character development that occurs in each book and for the crime that the team is solving. At times, it is a bit graphic and gruesome, but it is equally intriguing and captivating and keeps me engaged throughout. 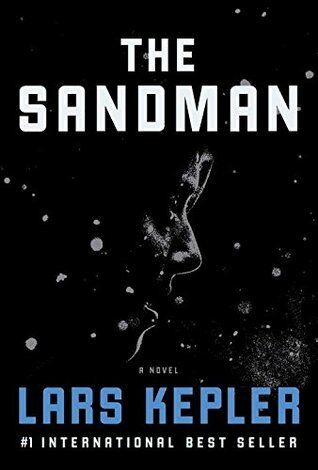 Audio thoughts: Once again, Jan Cramer shines in her narration of this series. She just gets these characters and the story lines. 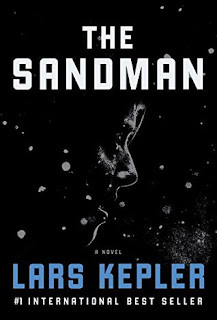 I truly believe that having the same narrator narrate this series really helps with the consistency in the voices and nuances of the characters that both Robert Bryndza has created for them and then Jan Cramer has made them to be. This book really comes alive with Jan Cramer's narration and I so hope she continues narrating the series for as long as Robert Bryndza continues writing it! My thoughts: This is the first book I've read by Claire Douglas and it definitely won't be my last. This book was so twisty and haunting - just how I like my psychological thrillers to be. 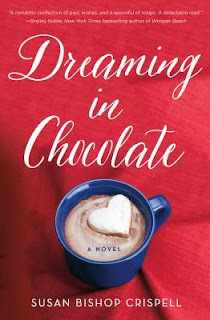 I found myself completely mesmerized by this story - I was immediately drawn in and felt that it never really let up until the very end, an ending I definitely did not see coming! I loved how this story was told - it alternates between the past, surrounding the time leading up to when Sophie goes missing, and the present when human remains have turned up that quite possibly may belong to Sophie. It is a chilling tale that pieces together just what happened leading up to that frightful night and as we meet all the players involved, you are taken on quite a ride. I found myself constantly trying to guess who was behind what happened to Sophie and questioning everyone we meet in this book. The characters are so richly drawn, yet their motivations are quite questionable and I loved this. I didn't know who was to be trusted and as pieces and clues are revealed, everything becomes more and more suspect. On top of this, the setting contributes so much to the story - it is atmospheric and creepy, adding another element to an already tense and chilling situation. 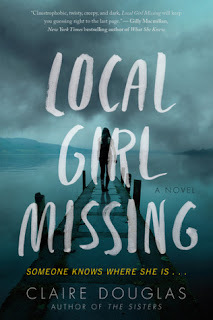 This book really kept me on my toes the entire time and the few twists and turns just added the right amount of suspense to heighten my enjoyment. I can't wait to read more from this talented author...she surely know how to spin a tale! Audio thoughts: I thought this was a great book to listen to and while I was unfamiliar with Hannah Murray prior to listening to this audio book, I have listened to Emilia Fox before. I thought both narrators did a great job with the parts they portrayed in this audio book - their pacing and intonations were good and they infused just the right amount of tension and suspense into their voices as needed. I enjoyed listening to this audio book. Two families, three generations and a lie that almost destroys them. Is their love strong enough to heal old wounds? Mae Summers and Gabe Broadbent grew up together in the idyllic Summers' Inn, perched at the edge of the St. Lawrence River. Mae was orphaned at the age of six and Gabe needed protection from his alcoholic father, so both were raised under one roof by Mae's grandparents, Lilly and George. Their childhood friendship quickly developed into a first love--a love that was suddenly broken by Gabe's unexpected departure. Mae grew up, got over her heartbreak and started a life for herself in New York City. After more than a decade, Mae and Gabe find themselves pulled back to Alexandria Bay. 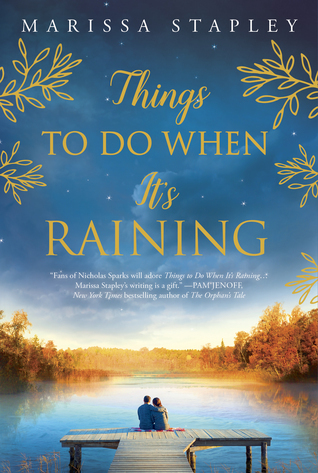 Hoping to find solace within the Summers' Inn, Mae instead finds her grandparents in the midst of decline with their past unraveling around her. A lifetime of secrets stands in the way of this unconventional family's happiness. Will they be able to reclaim the past and come together, or will they remain separate islands? Things to Do When It's Raining by Marissa Stapley is one of BookSparks "Winter Reads" reading selection picks.